Membership is open to any person 40 years of age and older, or who will become 40 years of age during the calendar year. Dues are $175 per year; however, memberships purchased before January 1 are $160. Your membership includes 1 companion pass and a subscription to the Rodeo News. Feel free to call the National Office at 928-684-9566 with any questions. The Associate Member program of the National Senior Pro Rodeo Association is made up of people from all walks of life. The common thread running between them is a love of rodeo and an appreciation for the skills of the Senior Pro Rodeo Professional Athlete. The Senior Pro Rodeo contestants appreciate the support of our Associate Members. The financial and moral support you provide helps to perpetuate the great sport of rodeo. 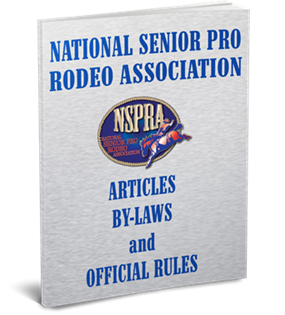 Money derived from the annual dues paid by Associate Members is used for operating and promoting the National Senior Pro Rodeo Association (NSPRA). In addition to helping promote the growth of the NSPRA, Associate Members are entitled to certain benefits. Every Associate Member will receive the following:. At $25 annual dues, members will receive an Associate Membership card, NSPRA decal and a 10% discount on Official NSPRA Merchandise. At $50 annual dues, members will receive an Associate Membership Card, NSPRA decal, 10% discount on Official NSPRA Merchandise, subscription to the official NSPRA publication, Rodeo News, a listing in Rodeo News, an invitation to the Finals Awards Ceremony and two free tickets to one night of exciting rodeo action at the Senior National Finals Rodeo. At $100 annual dues, members will receive an Associate Member certificate, four free tickets to one night of the NSPRA Finals, in addition to the basic benefits listed under "Individual" and "Family." At $250 annual dues, members will receive a beautiful NSPRA wall plaque, $25.00 NSPRA merchandise gift certificate, six free tickets to one night of the NSPRA Finals, in addition to the basic benefits listed under "Individual" and "Family." At $500 annual dues, members will receive a beautiful walnut NSPRA wall plaque, eight free tickets to one night of the NSPRA Finals, $25.00 gift certificate to the NSPRA merchandise booth, in addition to the basic benefits listed under "Individual" and "Family." At $1,000 or more annual dues, members will receive a walnut honoree wall plaque, four tickets for all NSPRA Finals performances, a $100 gift certificate to the NSPRA merchandise booth, in addition to the basic benefits listed under "Individual" and "Family." Platinum, Gold and Silver Associate Members will be listed in the National Senior Pro Rodeo Finals program and will also receive V.I.P. treatment at the awards banquet. Thanks to all these folks who believe in and wish to help support the NSPRA. Your love of rodeo warms our hearts and serves as an inspiration for all our members. To those who would like to join us as an Associate Member, please click on the link below, print the form, fill it out and return to the NSPRA.